NYT bestselling author Susan Wittig Albert returns to Depression-era Darling, Alabama…​where the ladies of the Dahlias, the local garden club, are happy to dig a little dirt! In the seventh book of this popular series, it looks like the music has ended for Darling’s favorite barbershop uiquartet, the Lucky Four Clovers—just days before the Dixie Regional Barbershop Competition. Another unlucky break: a serious foul-up in Darling’s telephone system—and not a penny for repairs. And while liquor is legal again, moonshine isn’t. Sheriff Buddy Norris needs a little luck when he goes into Briar Swamp to confront Cypress County’s most notorious bootlegger. What he finds upends his sense of justice. Once again, Susan Wittig Albert has told a charming story filled with richly human characters who face the Great Depression with courage and grace. She reminds us that friends offer the best of themselves to each other, community is what holds us together, and luck is what you make it. Bonus features: Liz Lacy’s Garden Gate column on “lucky” plants, plus the Dahlias’ collection of traditional Southern pie recipes and a dash of cookery history. Reading group questions, more recipes, and Depression-era info at www.DarlingDahlias.com. The Darling Dahlias and the Unlucky Clover tells the story of the ladies in a garden club in Depression era Alabama. The book gives glimpses of their lives and follows them as they solve a mystery. I love historical fiction, southern fiction, and mysteries, and cannot believe I am only now discovering the Darling Dahlias series! This book was such a delight. I grew up in the Deep South, and love the nostalgic, evocative small town that comes to life in this book. I could almost smell honeysuckle and hear the screened doors closing! "We know that flowers nourish the heart and soul, but a big plate of stewed okra with tomatoes, buttered corn on the cob, and potato salad go a long way to comfort a body, especially these days, when jobs don't grow on trees and money is as scarce as hen's teeth. Every Dahlia agrees: If you've got a garden, you'll have all the wealth you need -- and good health to boost" (p. viii). This is my first Darling Dahlias read. It took me a while to get all the characters straight, but the Autumn 1934 Club Roster, included at the front of the book, helped a lot with that. I really got invested in the characters easily and enjoyed following their stories. I especially loved the story of Liz Lacy's work at the law firm -- and re-emergence of her old beau. The mystery aspect of the story was well written and well paced, with good little clues here and there. I am very eager to catch up with the previous books in this series -- and to read upcoming Darling Dahlia books too. The historical details were also well done, and brought a lot to the small town, 1934 Alabama setting. I find the Depression Era fascinating, and rarely get to read books set during this time period. For foodie fans, there are also some delicious sounding pie recipes at the end of the book! They include some unique, old fashioned recipes like Vinegar Pie and Liz Lacy's Green Tomato Pie. I recommend The Darling Dahlias and the Unlucky Clover highly for fans of historical fiction, southern fiction, and mysteries. It is a delight from start to finish! 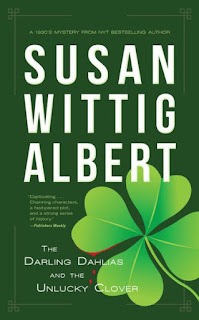 Susan Wittig Albert is the NYT bestselling author of over 100 books. Her work includes four mystery series: China Bayles, the Darling Dahlias, the Cottage Tales of Beatrix Potter, and the Robin Paige Victorian mysteries. She has published three award-winning historical novels, as well as YA fiction, memoirs, and nonfiction. 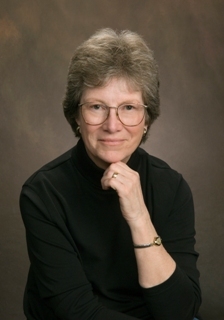 Susan currently serves as an editor of StoryCircleBookReviews and helps to coordinate SCN’s online class program. She and her husband Bill live in the Texas Hill Country, where she writes, gardens, and raises a varying assortment of barnyard creatures. For more information please visit Susan Wittig Albert’s website. Visit the Darling Dahlias Facebook Page. You can also find Susan on Facebook, Twitter, Goodreads, Google+, Instagram, and Pinterest. During the Blog Tour we will be giving away one paperback copy of The Darling Dahlias and the Unlucky Clover to one lucky winner! To enter, please enter via the Gleam form below. Yeah, I am so glad that you enjoyed meeting the Darling Dahlias! Loved your review! Thank you so much for hosting Susan's blog tour.